You should have already completed Tutorial_B1_Building_a_SimpleSerial_Project. 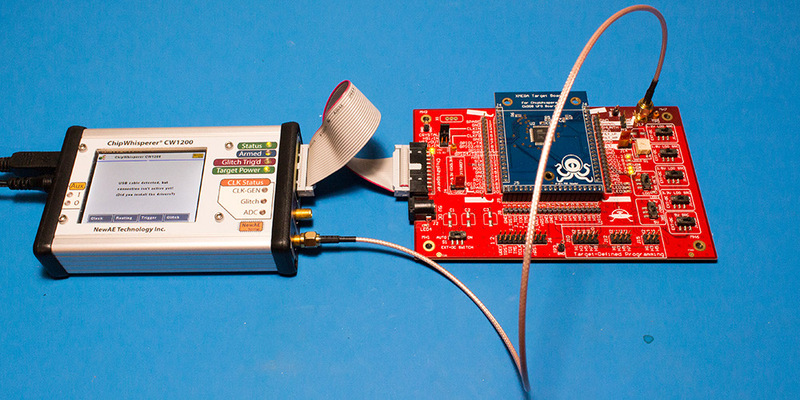 This tutorial assumes you are capable of building firmware for the target, programming the code, and connecting to the ChipWhisperer. 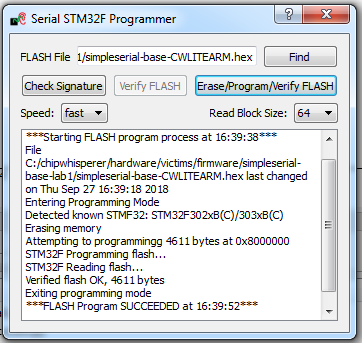 In this tutorial, we will once again be working off of the simpleserial-base firmware. Like with the previous tutorial, you'll need to have a copy of the firmware you want to modify and be able to build for your platform. The instructions are repeated in the drop down menus below, but if you're comfortable with the previous example, feel free to skip them and to just build your new firmware. 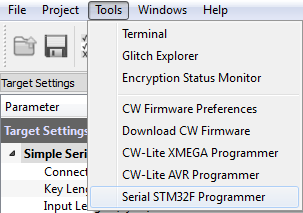 Alternatively, if you're not too attached to your code, you can just modify your firmware from Tutorial B1 Building a SimpleSerial Project and rebuild it from the same directory. At this point we want to modify the system to perform a number of operations. We won't actually use the input data. To do so, open the file simpleserial-base.c with a text editor such as Programmer's Notepad (which ships with WinAVR). Find the following code block towards the end of the file, which may look different if you just completed Tutorial_B1_Building_a_SimpleSerial_Project. The hardware setup is the same as in Tutorial B1 Building a SimpleSerial Project. The setup is repeated in the drop down menus below, but if you've already done that, skip to the next section. Programming the target is the same as in previous tutorials. The steps are repeated in the drop down menus below. 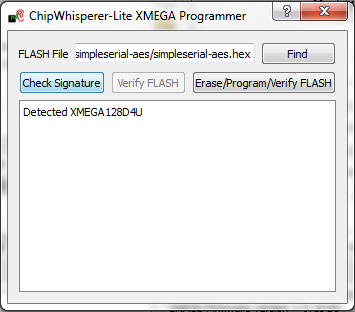 The basic steps to connect to the ChipWhisperer device are described in Tutorial_B1_Building_a_SimpleSerial_Project. They are repeated here as well, however see Tutorial_B1_Building_a_SimpleSerial_Project for pictures & mode details. Under the Python Console tab, find the connect_cwlite_simpleserial.py script and double-click. Check there are no errors on the connection. 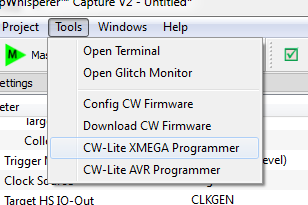 Under the Python Console tab, find the relevant setup script for your target (such as setup_cwlite_xmega.py) and double-click. Both the Target & Scope should switch to CON and be green circles. 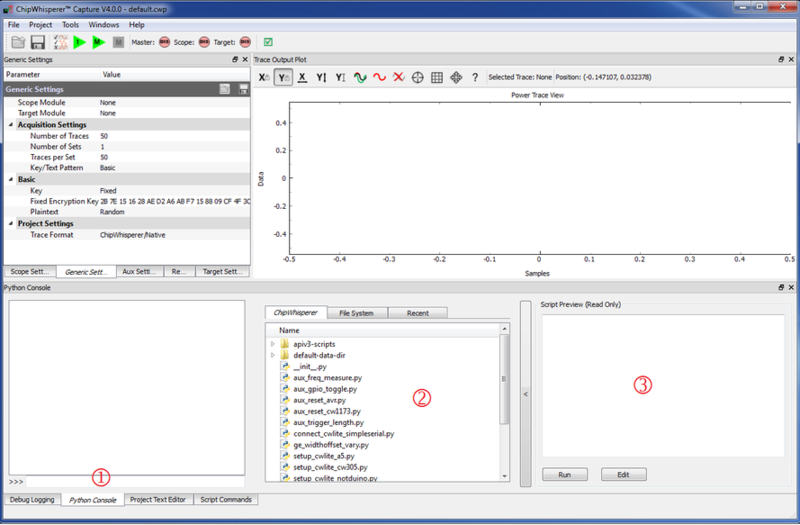 Open the status monitor (Tools > Encryption Status Monitor). Hit the Run 1 button. You may have to hit it a few times, as the very first serial data is often lost. 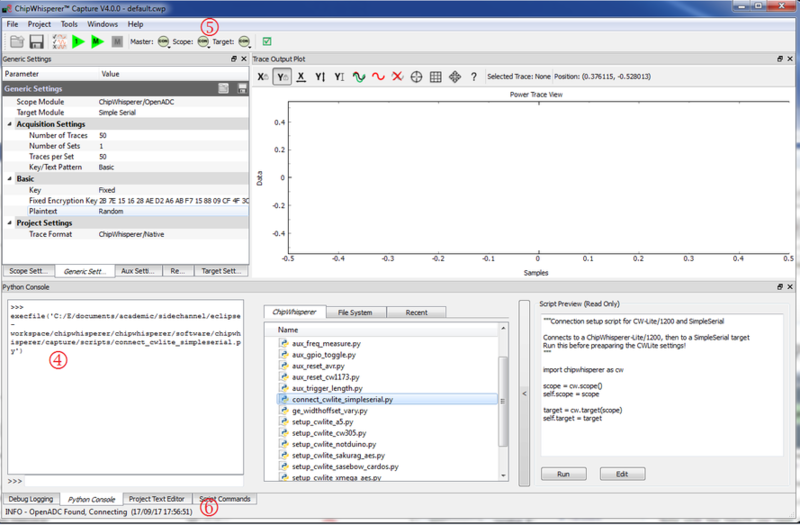 You should see data populate in the Text Out field of the monitor window. The Text In and Text Out aren't actually used in this example, so you can close the Monitor dialog. 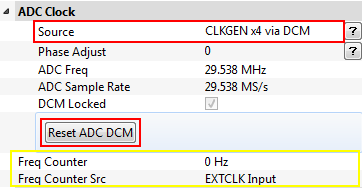 The ADC Freq should show 4x the clock speed of your device (typically 29.5MHz), and the DCM Locked checkbox __MUST__ be checked. If the DCM Locked checkbox is NOT checked, try hitting the Reset ADC DCM button again. Whilst there is a waveform, you need to adjust the capture settings. There are two main settings of importance, the analog gain and number of samples to capture. Under Gain Setting set the Mode to high. Increase the Gain Setting to about 25. You'll be able to adjust this further during experimentation; you may need to increase this depending on your hardware and target device. Under Trigger Setup set the Total Samples to 500. Try a few more Capture 1 traces, and you should see a 'zoomed-in' waveform. Multiples two 8-bit numbers together. Note that the capture clock is running at 4x the device clock. Thus a single mul instruction should span 8 samples on our output graph, since it takes 4 samples to cover a complete clock cycle. 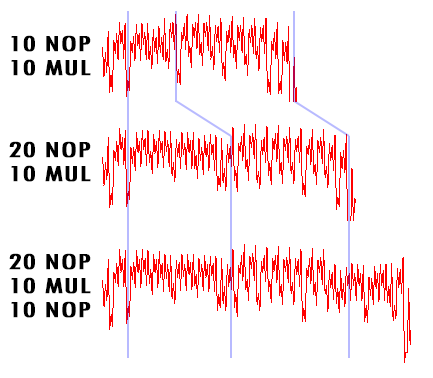 Note that the 10 mul instructions would be expected to take 80 samples to complete, and the 10 nop instructions should take 40 samples to complete. By modifying the code we can determine exactly which portion of the trace is corresponding to which operations. Pay particular attention to the section between sample number 0 & sample number 180. It is in this section we can compare the two power graphs to see the modified code. We can actually 'see' the change in operation of the device! It would appear the nop is occuring from approximately 10-90, and the mul occuring from 90-170. The following graph lines the three options up. 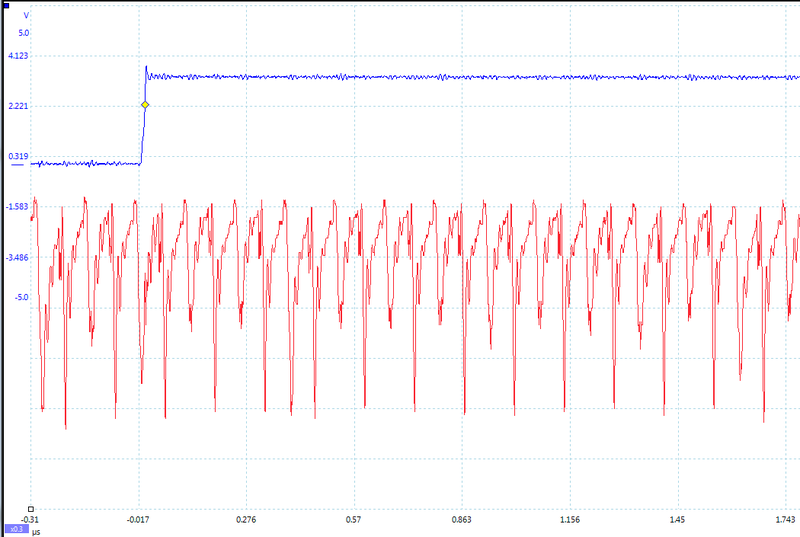 One can see where adding loops of different operations shows up in the power consumption. 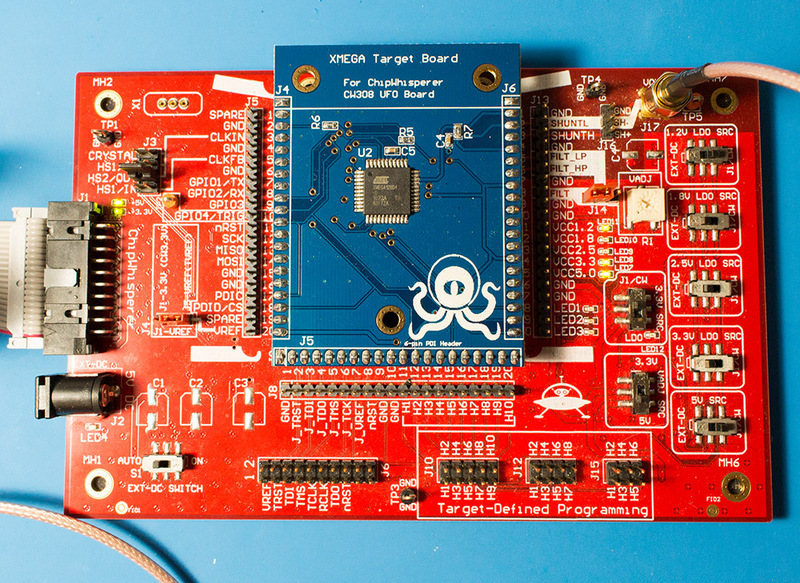 For the rest of this tutorial, we'll be focusing on the STM32F3, which is the microcontroller on the CW303 Arm target (though other targets should demonstrate the same principles). Since the STM32F3 is an Arm Cortex M4 device, we'll need to refer to the Cortex M4 Instruction Set and the Cortex M4 Instruction Set Summary. The first thing we'll do is replace the nop instructions, since from it's documentation page we can see the processor may not execute them. 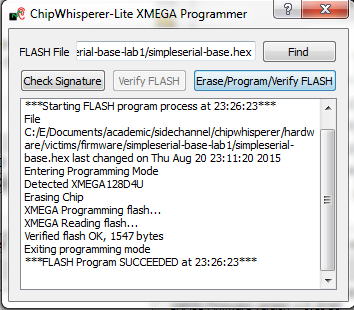 Instead, let's add some add.w (which is the 32 bit wide version of the add instruction) instructions. We'll be doing this since the mul instruction is always 32 bits wide and the 16 bit thumb instruction has a different power profile than the 32 bit Arm instruction. From the earlier links, we can see that both add and mul take 1 cycle each to complete. We can see the add.w and mul instructions near the beginning, staring about 10 samples in and ending about 90 samples in. There's not really any difference that we can see between the two, but we can see that they take up about 80 samples (20 microcontroller clock cycles) as we expect. A final area of interest is the clock phase adjustment. The clock phase adjustment is used to shift the ADC sample clock from the actual device clock by small amounts. 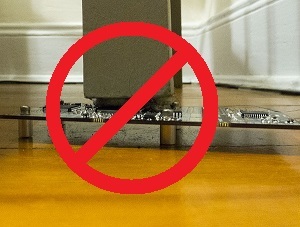 This will affect the appearance of the captured waveform, and in more advanced methods is used to improve the measurement. 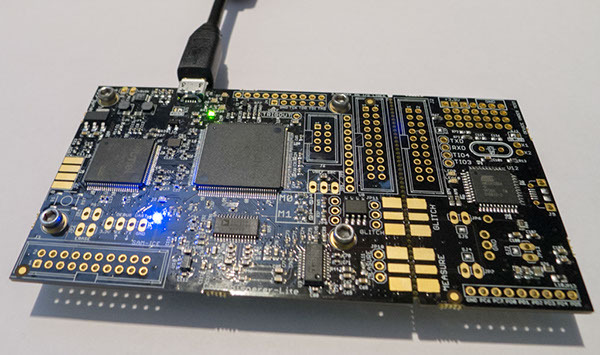 The specifics of the capture are highly dependent on each ChipWhisperer board & target platform. 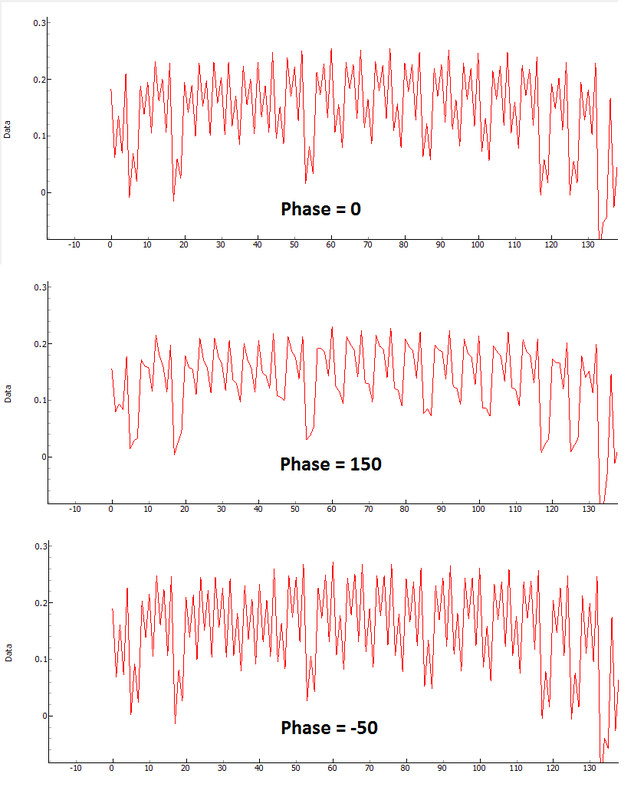 The phase shift allows customization of the capture waveform for optimum performance, however what constitutes 'optimum performance' is highly dependent on the specifics of your algorithm. In this tutorial you have learned how power analysis can tell you the operations being performed on a microcontroller. In future work we will move towards using this for breaking various forms of security on devices. 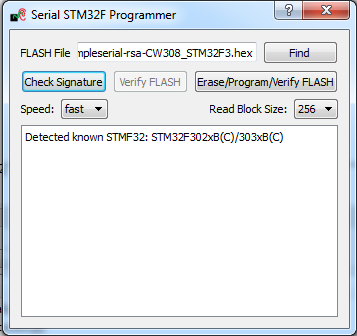 In particular, Tutorial B3-1 Timing Analysis with Power for Password Bypass will examine how we can use this information to exploit a password check. This page was last modified on 9 October 2018, at 09:18.